Progressives have to continue to agitate, but they dealt the right a blow this week. I admit: My first reaction to the news was worry. 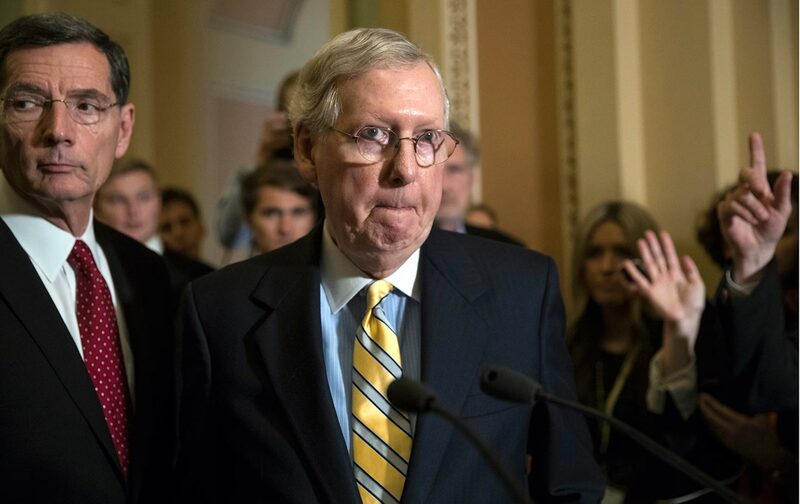 Was McConnell attempting to derail the inspiring and moving backlash the bill has provoked over the last week, and especially in the last few days? Does it give the corrupt and wily leader more time to cajole his caucus, and to spread around the $3 billion that the Senate bill saved, compared to the House bill? Specifically, will McConnell be able to bribe skeptical GOP senators who worried about the bill’s cuts to Medicaid as well as to opioid treatment, like Maine’s Susan Collins, West Virginia’s Shelley Moore Capito and Ohio’s Rob Portman, with a little more spending on both? Meanwhile, right-wing dark-money forces are spreading their own cash. Look how they’re trying to intimidate Nevada Senator Dean Heller, the most vulnerable incumbent in 2018, by continuing the ad onslaught they’ve already begun against him. I’m still worried. But I’m also elated. Passionate grassroots activism forced McConnell to pull the bill, and passionate grassroots activism will eventually defeat it, for good—if we keep it up. Our premature victory lap over defeating the first House bill was a rookie mistake in the age of Donald Trump. House Speaker Paul Ryan—the sociopath who, let’s never forget, began dreaming of slashing Medicaid over keggers in college—managed to revive the bill by actually making it more cruel. Faux-centrists fell for the addition of a minuscule appropriation to recreate “pools” for folks with preexisting conditions, which we also know will never work. But progressives got caught flat-footed, and we lost. Progressives also note that after the House bill passed it was widely predicted that McConnell would look to soften the edges of the Senate bill. Instead, he sharpened them, with Medicaid cuts and cuts to ACA subsidies that particularly hurt older working-class people. “McConnell is not stupid, but he is heartless,” says Dan Cantor of the Working Families Party. “He knows that people would die premature deaths if this bill passed, but he seems to not care. Tax cuts über alles is really the Republican slogan of our era.” It’s unlikely that McConnell postponed the vote because his greed is showing; it’s more likely he realized he needed a few cosmetic improvements. There are some other developments worth noting about McConnell’s troubles this week. First, remember that many Democrats worried that red-state senators like West Virginia’s Joe Manchin, North Dakota’s Heidi Heitkamp, and Montana’s Joe Tester might be vulnerable to GOP appeals on an ACA overhaul. All three have been as staunch on it as progressives. Second, the GOP’s trouble has forced the party’s “moderates” like Murkowski and Collins, instead, to court Democrats. Both said Tuesday that they want to work on bipartisan improvements to the ACA. It’s unlikely to happen, says Senator Chuck Schumer, unless Republicans drop their demands for massive tax cuts for the rich and the decimation of Medicaid. Senator Bernie Sanders went further, as well he should: On MSNBC Tuesday afternoon, he welcomed Republicans to join him in expanding Medicare to 55-year-olds and proposing a public option for states where ACA exchanges are faltering because private insurance companies are pulling out. I don’t expect Collins or Murkowski to join him, but I appreciate Sanders’s putting those ideas on the table as reasonable proposals the GOP shouldn’t reject—even if they do. And politically, both Collins and Murkowski will now have to live down their pleas for a bipartisan bill should they vote for a harsh GOP alternative. Finally: Let’s remember Republicans, controlling the White House, Senate and House of Representatives, planned to repeal the ACA by Memorial Day. Now they’re missing July 4 and there’s a decent shot they’ll miss Labor Day, too.